Browser-based RPGs are becoming more mainstream than ever these days. 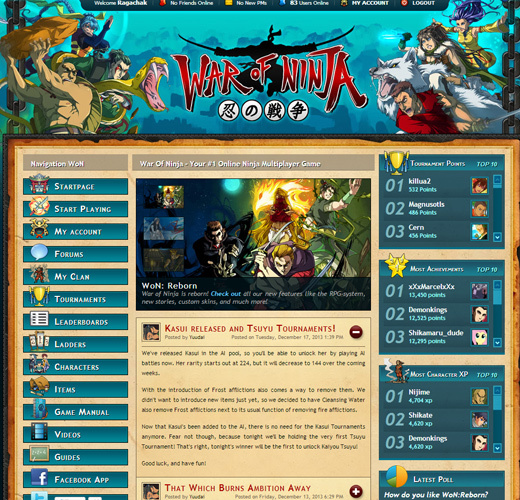 War of Ninja is an RPG that fits this mold, where you do not have to download a client, and can log in from just about any browser at any time to get some quick gameplay in. 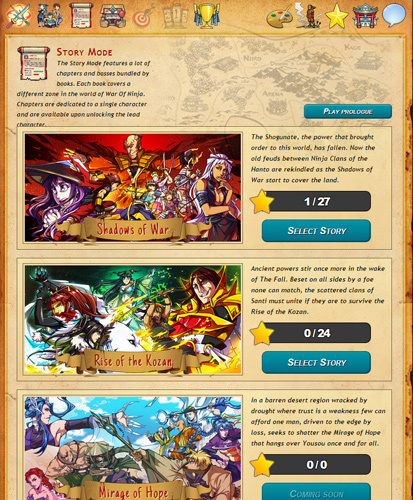 There are a variety of game modes, and sliding difficulty for battles. As a gamer, I do not have a lot of experience in browser games, except ones that wish to get you to pay for progress (The Microtransaction model popular on Facebook). Luckily, this one does not appear to have any pay-to-win function that I have seen. Your currency is gold, which is acquired through various in-game means, and I played for several hours at a time without having to stop, save defeats becoming so crushing that I absolutely had to take a breather. This is easily one of the most positive things I have to say about the game. 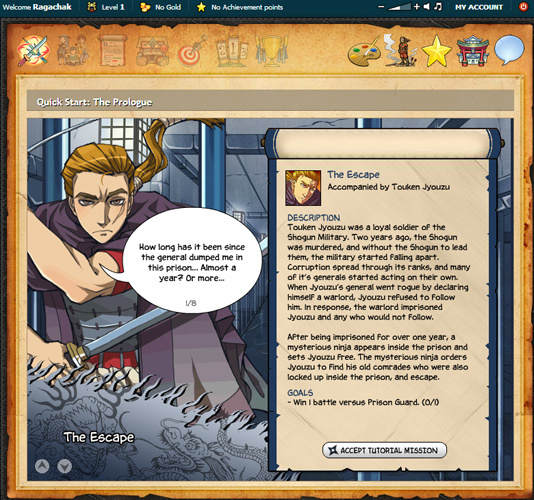 The community is fairly active, and at most times of the day you can find players chatting in the small chat applet provided at the top left of the screen. It manages like many browser or forum based games do, with options visible to click that do a variety of things, such as change your personal settings, send and receive private messages, and check what gold you have spent in-game, in case you happen to be curious where your in-game money is going. For fans of this type of turn-based game, there are lots of options for you to enjoy. Whether it is the story mode, quick battles to unlock characters and gold, or tournaments and ranked battles, there is something for every playstyle. The story itself is very reminiscient of traditional Japanese Ninja Anime, such as Naruto. You play using teams of three, and use a variety of ninja tools and skills to defeat other teams, regardless of what mode you are in. There are several modes of gameplay for War of Ninja. At this point in the game, I was not a high enough level for the Ranked Matches, which are in their current preseason. The requirement for that is level 25; however, there are tournaments that players of any level can enter provided they have the gold required for the entrance fee. Players can mail each other gold with a slight tax on the transaction, meaning if you have a more experienced friend they can be a serious help in getting started. My in-game time was spent in Story Mode, Quick Battle, and the Prologue, since I had no backer to fund the hefty tournament entry fees. My team is nowhere near powerful enough to compete even if I did. Prologue: The prologue teaches you the how-tos of the game proper. You start with just one ninja, but as it progresses, you unlock two others that assist you through the trials that you will face later in this mode. It is not terribly long, but it does succicintly explain how to handle combat. In this you learn that for each person on your team that is alive at the end of a turn, you gain one energy. However, it is not always energy that actually helps you. Each turn, if you meet the requirements, you can convert two points of one element of energy into one point of another. The energy pool is shared across all three characters, so a fair amount of thought has to go into what you use. Story Mode: In order to access the story mode after the prologue, you must use “Quick Battle” to unlock characters. 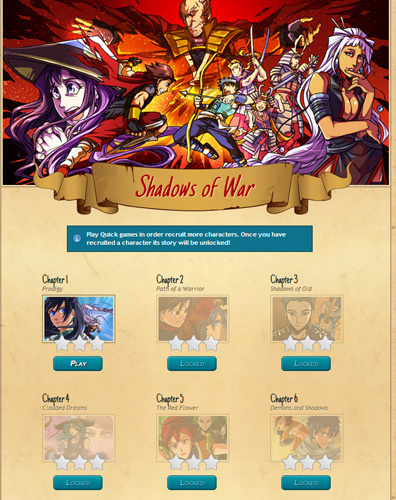 Each chapter of the story is based on a particular ninja, and you must unlock them to gain access. Unlocking characters is not a given, and there is a chance with every Quick Battle to acquire someone, given you have the gold to hire them to your side. The story is less immersive than what I hoped for. In the last iteration of War of Ninja your character led a team who helped the Ninja clans who were in peril. In War of Ninja: Reborn, it feels less immersive, like watching an anime or reading a manga about ninjas, rather than being immersed in the storyline. Having to constantly play Quick Battles just to access the story was very off-putting for me. I would rather be able to unlock characters through the story rather than this side venture that is totally based on chance. As you complete chapters, you get gold stars on the list of said chapters. These increase the difficulty and show that you have completed the chapter at least once. You do not need to acquire all three gold stars to proceed with the tale however. 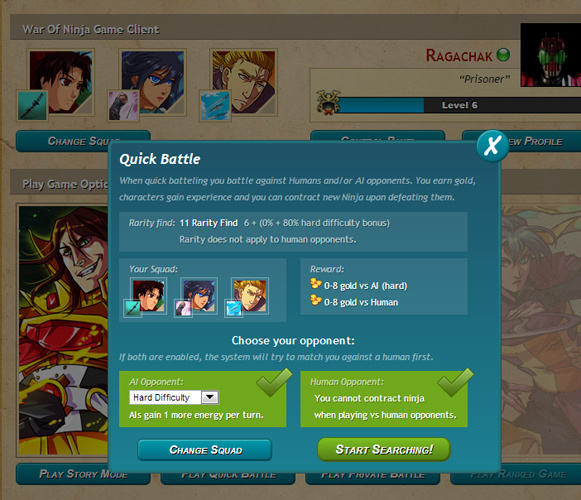 Quick Battle: Quick Battle provides immediate access to combat against random foes. You can choose a preference for the AI, or human opponents, and if you have human opponents selected it will put priority on finding a suitable thinking opponent before matching you against an AI substitute. There are differences in difficulty besides level. Energy gains vary by level as well. The harder the difficulty, the more energy your enemies attain. In AI matches, you can contract ninja after the victory is gained, but not in a human battle. 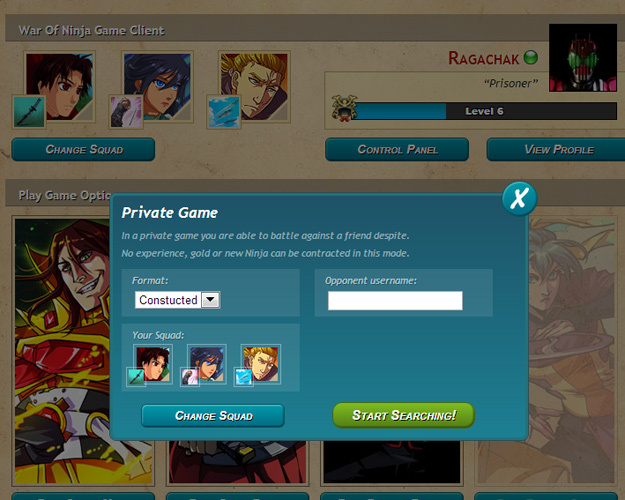 You can pick from any ninja you have already contracted, which you can set up in premade teams for fast access. This is where I first learned one of the most frustrating things about the game. As listed above, your energy gains are random. It does not always give you something that will help. More often than not, I would be defeated because I did not have the energy that I needed to perform skills. One or two of my team would be able to attack, but very rarely did all three get to use one of their ninja abilities, or even one of the tools I purchased in the shop. Private Battle: Private matches are battles against specific people. You can invite one of your friends to do battle with you in a pair of modes. One allows you to establish your team in advance while the other tests your ability to react on the fly by utilizing a drafted team. This can go very well or very poorly, depending on who gets drafted to your team. The same game rules apply here, but you do not get to contract ninja at the end of battle, since these are only human opponents. Ranked Game: As of this writing, I do not have the level to attempt ranked matches, but there are a variety of rewards for doing well. The Ladder is presently unavailable, as the game is currently in preseason. Tournament: There are tournaments up pretty much anytime during the day. These generally require a gold fee to avoid people abusing systems to get free tournament points; this way they can’t climb the soon to be implemented ladder with no work. 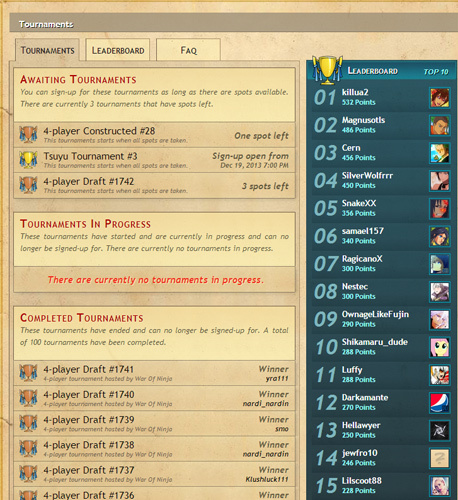 To join, you simply go to “Battle,” and click “Tournament.” If there are slots available, you will be able to enter. The amount of rounds that you will play vary from tournament to tournament. There are varieties of tournament styles as well, such as constructed (where your team is picked by you), Tsuyu (where ninja are offered as a grand prize), and the draft. One of the major issues of War of Ninja is balance. Not all ninja are created equal. This in and of itself is all well and good. In most games, there are characters that stand above others. Whether it is the God-tier characters/flavors of the week in League of Legends, to the S-tier fighters in BlazBlue or Street Fighter, somebody is almost always better than whomever you have unlocked or picked. But when certain team comps can crush any competition, this can lead to frustration, or boredom. There are also problems with the game, whether intended or not, that can lead to easy victories. One fine example of this I noticed without browsing the forums or internet. At level 3, you can unlock the Ninja Shop, where you can buy other tools for your characters. One of these is the Poison Dart. It’s an active between levels 1-3 of a character, and it provides a poison damage over time for five damage a turn for a set amount of turns. This is a fine way to deal damage. But, if a ninja has a damage-soaking shield, this poison damage will hit them anyway, and not lower the shield. This is made more powerful by Poison Dart stacking. At one point, I was fighting a level 10 boss at level 5, and stacked the ability 5 times. Now, only one person appears to be able to equip it at a time, but you can easily build your team to make this an all encompassing strategy. Simply have a damage shield on your team, and a pair of stuns, and slowly nick away at your opponent. There are several ways to cheese your way to victory in War of Ninja. If I could come up with one just by playing casually, just imagine what the veteran players can do! The graphics for this game are very simple. The ninja portraits are detailed enough, and each character does look different. 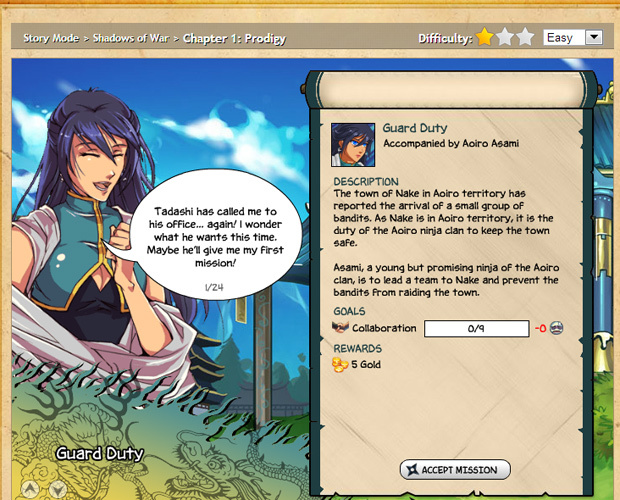 But this is a browser game, so I do not have high expectations of it having cell-shaded, 1080p worthy art. It is simple, but it is not necessarily a bad thing. The character art is exceptional, though. There is very little actual animation, but it is a decently drawn flash game. The controls are simple, easy to use, and explained in the tutorial. I had very few problems in the game, and those I did experience were mostly related to mouse drag rather than browser lag. As a flash game, the left click is the only button you truly need. Despite some not so obvious commands like cancelling an attack declaration, the game is straight forward enough to be able to play without bothering with the tutorial. While this game has a wide variety of features to choose from, in order to truly see them all, it requires a great deal of time commitment. It is a very long haul to see all of what this game has to offer. Some of this can be marred by the balance issues it has. There are exploits that crop up from time to time, and balance issues as stated earlier in the article that can seriously injure one’s enjoyment of the game. However, the staff does seem to be pretty quick to react when they find a major exploit that can ruin gameplay. There is music, and there are sound effects, but I personally found them to become monotonous and tedious to listen to after awhile. Thankfully, there is a gauge at the top of the screen to lower these volumes. The music is not bad; it is soothing, and the theme of Japanese sounds are very appropriate. I just did not see enough variety in it to keep it active after a couple of hours of gameplay. i’m glad i didn’t try this game, even though the dialogue looks super amazing >.>….. Thank you for a another great review.